He is my Wonderful Counselor. He is my Mighty God. He is my Everlasting Father. He is my Prince of Peace. Yesterday as I began the Advent study, joining She Reads Truth for their study, I was reminded of all the things Jesus is for me. For me. He came to this world to be born of a woman, to be beaten and murdered, and He did this for me. My Jesus values me so much that He left His throne in Heaven to come here. I am letting that sink in today. Today is the 4th annual Christmas Blessing Giveaway. 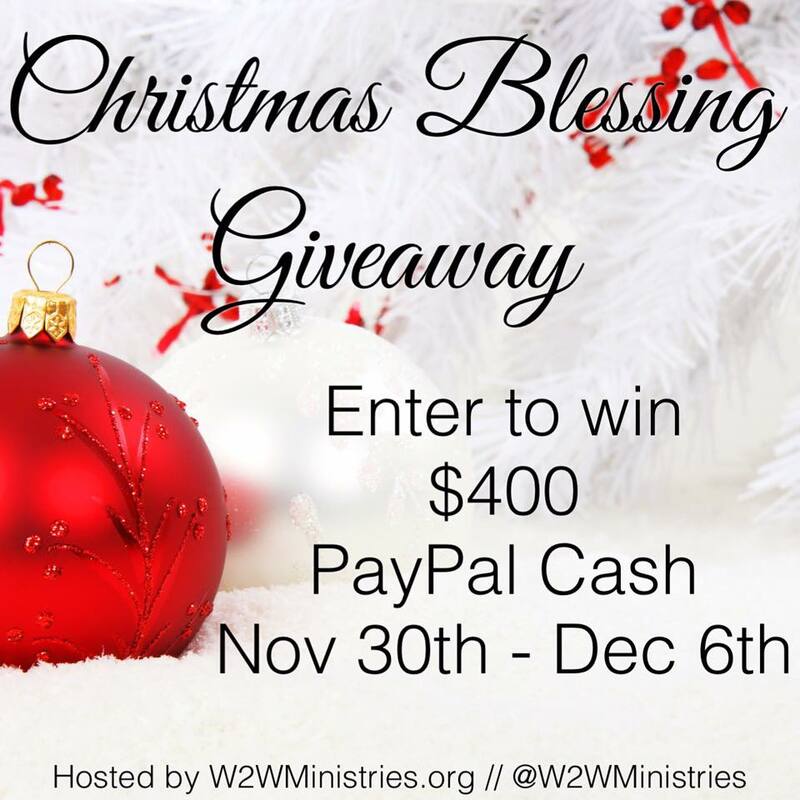 We have teamed up with 17 other bloggers and one of our blessed readers will receive $400 in PayPal cash! What a blessing that will be this Christmas season! Gena Mayo – I Choose Joy! Giveaway Rules: No purchase necessary. Must be 18 to enter. Void where prohibited by law. Open to US and Canada residents only. This giveaway is in no way sponsored, endorsed, or associated by Facebook. By entering this giveaway, you agree to release Facebook, Woman to Woman Ministries and all participating bloggers of all liability. Contest ends at 11:59PM CST on December 6, 2015. Winner is randomly chosen by Rafflecopter and will be emailed. To enter to win, complete each task in the rafflecopter below. Remember, come back each day and share the giveaway on social media for more entries! My favorite Christmas memory is having a house full of family. We all gathered at my parents. Now, we are so spread apart. We all live in the same town, but as children have grown and have families of their own, it's hard to get us all together. Great memory Barbie! I love being together with family. My favorite Christmas memory is the first Christmas Sam and I were together. We spent it over Skype, but it was one of the best days ever. I remember being so excited for him to open the gift I'd sent him (which we agreed wouldn't happen until Christmas Day). That is so sweet Emily! Thanks for stopping in! My favorite Christmas memory was going to see the Radio City Music Hall Christmas show. How fun! Thanks for stopping in. My favorite Christmas memory is the last Christmas I spent with my mom. That is a special memory I am sure. Thanks for stopping in Debby. My favorite Christmas memory is going to the candle light ceremony at church every Christmas Eve as a child and singing Christmas songs. Wonderful memory Elizabeth! Thanks for stopping in!